Bommallatam. An event of Rotaraction at the Juvenile Home in Coimbatore for the first time on 14.02.2006[Tuesday] from 5:30PM to 7:00PM. 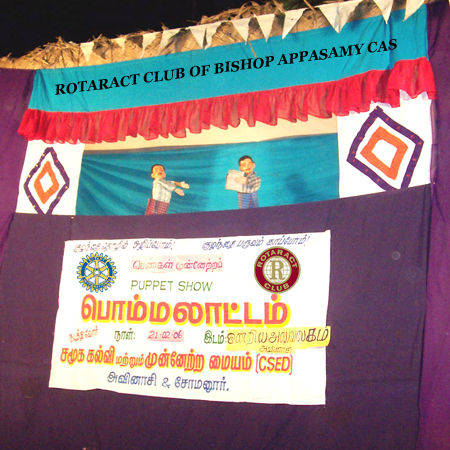 The Puppetry Show was exclusively organized to create awareness among the delinquents. At the Observation Home there were about 27 delinquents in the month of Feb [strength keeps changing. ], where three meals are provided to the delinquents. There are three cells two for boys and one for the girls. The strength of the girls is usually lesser than the boys. There are not more activities for the children especially for girls; the boys are engaged with some kind of General Knowledge classes. Two wardens, a male and a female take care of the delinquents. Our club members were very much eager to interact with the delinquents to know their causes for being a delinquent.] As per the collected data, there were 17 boys and 10 girls, the delinquents are involved in various offences like beggary, misbehavior, pick pocket, murder, etc... The most interesting fact is that the delinquents were frank to say their own offence without any hesitation. They are frank that they are not happy there and want to return to their own places soon. The children will be taken to the court weekly thrice for their respective cases. To our surprise there were few who were really not to be blamed. But it is not correct to assume that every ‘teddy boy’ is actively engaged in delinquency. These names often mislead people. It is unjust to assume automatically that a youngster who likes rock ‘n’ roll music or bizarre clothing is on his way to becoming a delinquent if he is not one already. Too often, the adult word has used the word ‘delinquent’ to express anger or bewilderment at adolescent tastes. The show started with an introduction by Mr.SAGADEVAN, Coordinator - Centre for Social Education and Development (CSED), introducing his team members in his speech. He said that many shows had been conducted for various people and this was the first time at Juvenile Home. The show started with a theme song, it involved ten characters that played a socio-economic role, telling the children about the importance of education and any crime is punishable by the law. The show ended around 6.15 PM. Towards the end, the delinquencies were asked to share their experience. Few tender voices said to Rtr.Sandeep “it has changed our mind to get back to our normal life of schooling “. While one gave importance only to a cup of tea , that was needed the most. Few games were conducted for them which made them feel relaxed . The secretary of Juvenile Home advised the children to forget their past and to set new goals for a good future. At 6.30 P.M tea and mushroom rolls were distributed .It was received by the delinquency with a great joy and a word of thanks as well. At 7.00 P.M the cells of both boys and girls were locked respectively. “We are very happy, do come within next week to visit us for I will leave to my home town by then “, was a request by girl child who was an orphan.